Borgo Marinaro is a small port and adjacent buildings (now mostly restaurants and yachting clubs) built into the eastern niche formed by the Castel dell’Ovo and the causeway that joins the castle to the mainland; it is protected by a breakwater. Essentially, it is what is left of the historic seafront of Santa Lucia. Borgo Marinaro came into existence at the end of the 19th century when large sections of the old seafront were torn down to make way for the new buildings of the risanamento, the 30-year urban renewal of entire sections of Naples. Originally, as the name implies (“Sailors’ Quarter”), the new area was meant to house the fisherfolk displaced by the project. As it turned out, the project dragged on for so many years that most of the local population simply got tired of waiting and moved a few blocks inland into streets that run behind via Santa Lucia and up the Pizzofalcone hill. 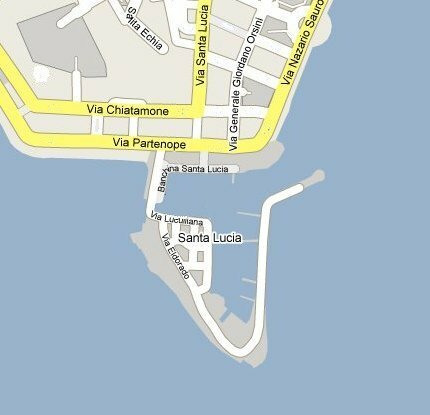 Via Santa Lucia and via Chiatamone (see map) were originally seaside roads but were relegated to the inside, forever separated from the sea by an entire string of new hotels, residences and office buildings built on landfill and, themselves, overlooking the new seaside roads of via Partenope and via N. Sauro. As a result, Borgo Marinaro was taken over by facilities of the more affluent, although there are still some fishermen who operate out of the port.